Marika Kesler and Aisling Macken, Conservation Assistants on the Pacific barkcloth project. One of the first tasks we took on for this contract was photography of approximately thirty cloths. As these objects were too large for the CTCTAH photo studio, we set up a temporary studio using photographic backdrop paper on our lab’s partition wall and hung each object using magnets to give us the focal distance we needed. Some of the objects were still too long for even this solution, and we devised a method of hanging partially unrolled objects in a similar manner. The use of magnets in this situation was particularly successful as it allowed us to hang a succession of objects quickly. Photographing large objects in a small space is challenging, and creating this solution will no doubt be valuable experience for our professional development. We especially enjoyed the photography aspect of the project as our primary role was to construct storage solutions and pack the objects for transport, and the photography allowed us to see the full range of the research collections up close. If you would like to see a time-lapse video of the partial unrolling process of a longer cloth, follow this link and follow us on twitter for further updates. Many of the objects from Kew Gardens are quite large and were folded into small bundles. One of the outcomes of the project was for these cloths to receive new storage solutions that allowed for greater accessibility for present and future study. 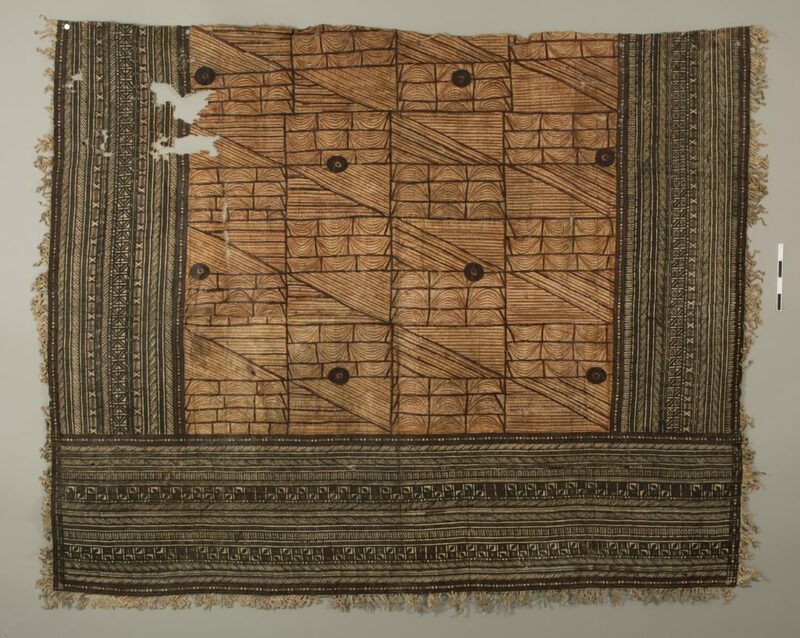 A particularly interesting example is the Royal Tongan cloth (43023), measuring 4.7 by 5.4m. For this object, as for many, we constructed a larger custom box with internal support pillows to minimise folding and ensure no sharp creases were made. 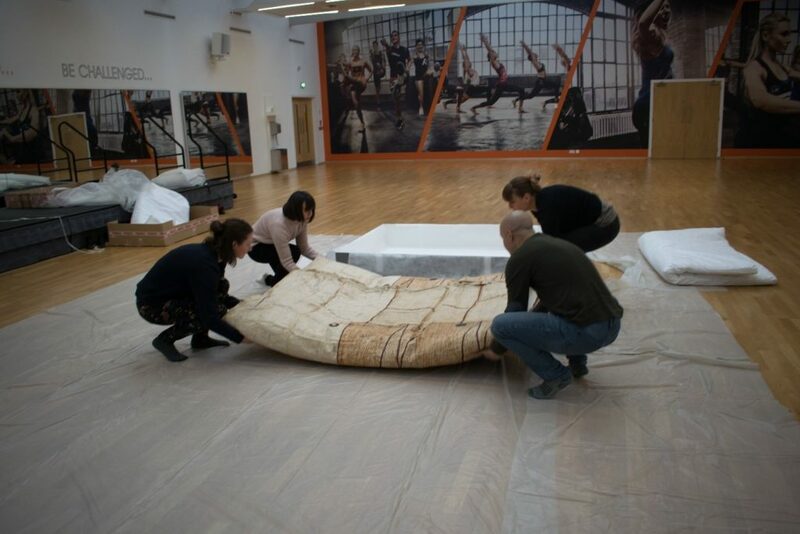 Due to the size of the cloth, we enlisted the help of four volunteers and booked a dance hall at Glasgow Life’s Kelvin Hall to enable full viewing for the researchers as well as facilitate handling as we refolded and padded it to place it in the new (much larger) box. 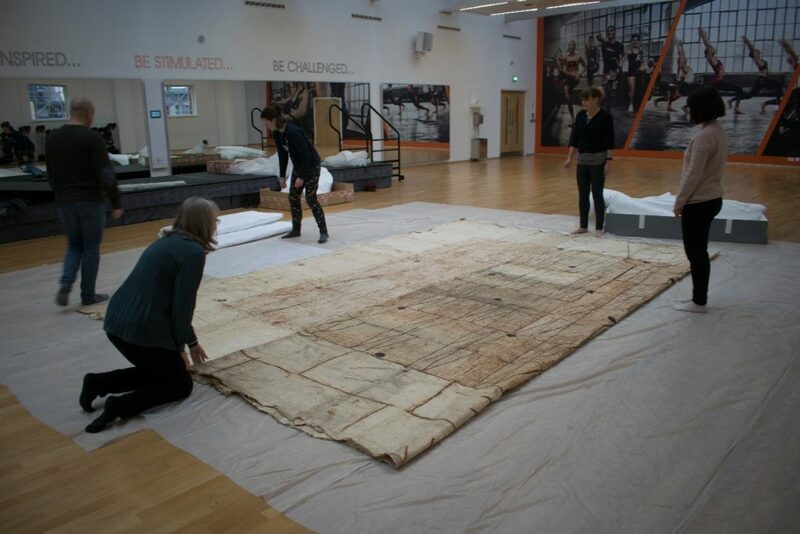 In figures 2-5, you can see the true scale of the cloth and the challenge it presented for handling and packing. 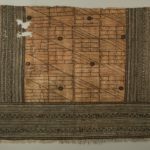 Recently, the half of the objects belonging to Kew Gardens (including the Royal Tongan) were returned. This involved watertight packing of individual and grouped objects before loading into a transport van, and road tripping with our lovely driver Garry all the way down to London. Mark Nesbitt, Frances Cook, and the rest of the team at Kew were happy to see their objects back in more comfortable storage. We stayed in London for the next day to lend a hand shelving everything back into the EBC’s store, a process documented on the project’s twitter . A number of these objects were earmarked for display at the symposium, Recent Advances in Barkcloth Conservation & Technical Analysis, at Kew on 7th December.